How much would you pay for some hip hop memorabilia? $1500 or $80 for the same garment? 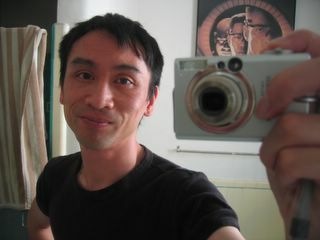 Of course, I'm talking about eBay! Over the years I've hunted down authentic Double Goose Country leather 3/4 length jackets (and less original versions too,) but my search for a burghandy or black colored Def Jam record label baseball jacket has been tough! 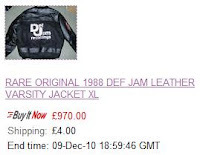 Even though I know how rare these collector's garments are (especially in my size "small,") I can't believe how greedy folks get...an eBayer has the audacity to *try to* charge way over $1000 for his Def Jam varsity jacket. May be he should get the hint...after at least three re-listings it's still not selling. Best Offer? What would you offer? When I spotted Miranda (also from the U.K.) selling her husband's vintage hip hop collection (omg, don't get me started!!) I advised her to raise her price of her exact same Def Jam jacket after seeing the one above. Despite my advice it stayed at a low price and sold for...wait for it...$80! !